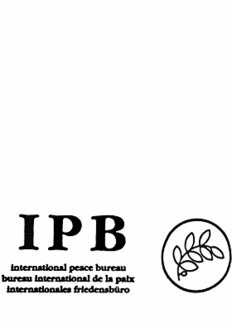 The International Peace Bureau (IPB) was founded as a result of the third Universal Peace Congress in Rome, 1891, with Fredrik Bajer one of its principal founders and its first president. Established at Bern as the central office and executive organ of the International Union of Peace Societies «to coordinate the activities of the various peace societies and promote the concept of peaceful settlement of international disputes», the Bureau was, in its early years, virtually synonymous with the popular peace movement of that time – that is to say, with all the peace organizations affiliated with it and with their then homogeneous ideology and program. Figuring prominently in this program were such matters as arbitration procedures, bilateral peace treaties, the creation of a permanent court of international justice and of some kind of intergovernmental or even supranational body or bodies for cooperation and negotiation between nations. To disseminate and promote these ideas, the Bureau arranged the annual peace congresses, formulated their agenda, and implemented their decisions. It also provided a means of communication between the various individuals and organizations working for peace, and collected and issued information, often through its fortnightly publication Correspondance bimensuelle and its yearbook Annuaire du mouvement pacifiste. Until the Bureau received the Nobel Peace Prize in 1910, its funds for these activities were limited, varying each year «from 8,000 to 9,000 francs»1. Along with the Interparliamentary Union, with which it had a close relationship, the International Peace Bureau was influential in bringing the concern for peace to the attention of both public opinion and politicians, being very successful in promoting what eventually took form as the League of Nations. World War I not only hindered the work of the Bureau but brought the International Union of Peace Societies to an end. Consequently, after the war was over, «the IPB was not able to keep the same predominant position amongst international organizations and institutions. Since an intergovernmental body existed – tentative and defective though it was – and since the ideas of arbitration, mediation, etc., were accepted by many governments, it was no longer necessary for a nongovernmental organization to focus its own activities on these matters. The international peace movement, furthermore, developed into a more complex and diversified pattern of ideologies, interests, and projects, and it was no longer either possible or even desirable to have only one coordinating body. The IPB, therefore, had to try to find its own image. It concentrated its efforts mainly on attempting to communicate certain ideas and proposals of the peace movement which represented the broad outlines of opinion within nongovernmental organizations concerned with questions of peace and humanitarian welfare, to those circles responsible for decisions on the governmental and intergovernmental level»2. In order to facilitate this reconstruction of activity and to work in closer contact with the new League of Nations, the Bureau moved in 1924 to Geneva, which is still the site of its headquarters. It continued to organize annual conferences, build up the library, and publish a periodical. During World War II, for technical and ideological reasons, the work of the International Peace Bureau came to a halt, and its assets were temporarily placed under the supervision of the Swiss authorities. In 1946 some of its former member organizations met to reestablish the Bureau and its work. The result was a new international organization called International Liaison Committee of Organizations for Peace (ILCOP) which, after several years of negotiations, was recognized on January 20, 1961, by the Swiss Federal Council as the legal successor to the old International Union of Peace Societies; the assets of the Bureau were given to the ILCOP and its library deposited with the UN in Geneva. Shortly afterwards, ILCOP readopted the name International Peace Bureau which now stands for the international organization as such and for its secretariat in Geneva; administration of its funds was transferred to the newly established Foundation ILCOP which has the character and function of a legal body under Swiss law. (d) national and local organizations working directly for peace and international cooperation, or having the work for peace as one of their aims. Associate membership without voting right is open to organizations and individuals who support the aim of the International Peace Bureau3. The present aim of the International Peace Bureau is «to serve the cause of peace by the promotion of international cooperation and nonviolent solution of international conflicts». This is much the same as its original objective, but must now in most cases be interpreted and implemented differently to meet the current international situation. The Bureau still works to facilitate communication between different national and international peace organizations, and between these organizations and governmental and intergovernmental bodies, doing so in accordance with its established principle of non-alignment with such bodies. It still acts as a clearing house for ideas, and it still coordinates the activities of different peace organizations, but only insofar as member groups desire it – it no longer acts as a permanent agent, decision-maker, or spokesman for the peace movement as a whole. It still makes the organization of international conferences the core of its activity, but such conferences are now more «working parties or seminars» than congresses, and they concentrate on the different aspects of one specific subject or project rather than trying to give a general survey of all problems, as former conferences normally did. In recent years the Bureau has adopted four procedural steps in handling these projects: preparation of available documentation in a «Working Paper» the conference itself (often preceded by a smaller preparatory seminar), whose participants are recruited to secure attendance from three categories: «(1) representatives of governments and governmental bodies, (2) peace research workers and other experts in the specific field, (3) representatives of peace organizations and other national and international organizations concerned with the specific subject of the conference»4; the editing, publishing, and distributing of the Conference Report, completed with any further documentation collected; and the final follow-up on the Conference findings and decisions, which in many cases involves transmitting proposals to certain governments or certain intergovernmental bodies. Such projects require an average of two to four years for completion, with the Bureau being able to handle a maximum of two at one time. Recent projects have included that on UN peace-keeping operations, initiated by the Bureau, and the NGO [Non-Governmental Organizations] Information Seminar on Disarmament, which it co-sponsored; the Seminar’s other sponsors have continued action in this field, and since February, 1970, IPB has been the secretariat for the Special NGO Committee on Disarmament. In process are projects entitled «The Right to Refuse Military Service and Orders» (begun in 1968 as IPB’s contribution to the «International Year for Human Rights» when the UN so designated that year) and «Alternatives to Military Defense». Ducommun, Élie, «The Permanent International Bureau of Peace» in The Independent, 55 (March 19, 1903) 660 – 661.
International Peace Bureau, «General Background (Summer, 1970)» [mimeographed document]. La Fontaine, Henri, Bibliographie de la paix et de l’arbitrage international. Tome I, Mouvement pacifique, pp. 150-152. Monaco, Institut International de la Paix, 1904. * This history is based on the IPB’s pamphlet The International Peace Bureau: History, Aims, Activity, written by Dr. Ulrich Herz, secretary-general of the IPB (Geneva, 1969) and on the IPB’s six-page mimeographed document entitled «General Background» and dated Summer, 1970. The editor gratefully acknowledges the IPB’s kind permission to use this material freely, both substantively and verbally. 1. Élie Ducommun, «The Permanent International Bureau of Peace», p. 661. 2. IPB, «General Background», p. 2. 3. Taken from Ulrich Herz, The International Peace Bureau, p. 10. 4. IPB, op.cit., p. 4. This text was first published in the book series Les Prix Nobel. It was later edited and republished in Nobel Lectures. To cite this document, always state the source as shown above. For a more updated history, see the History page at IBP home page.